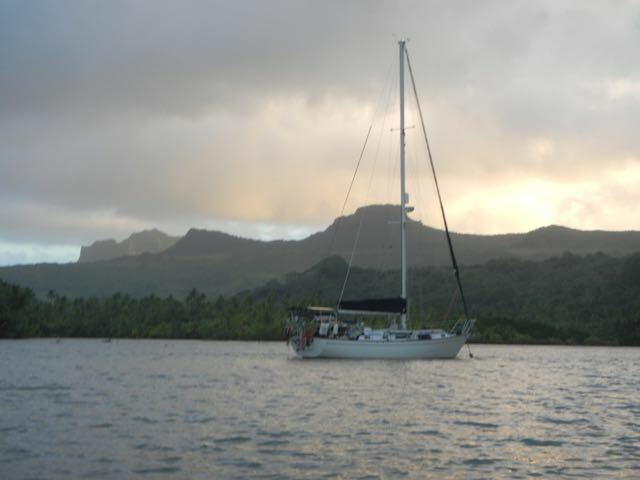 Fa'aroa Bay is back on Raiatea. 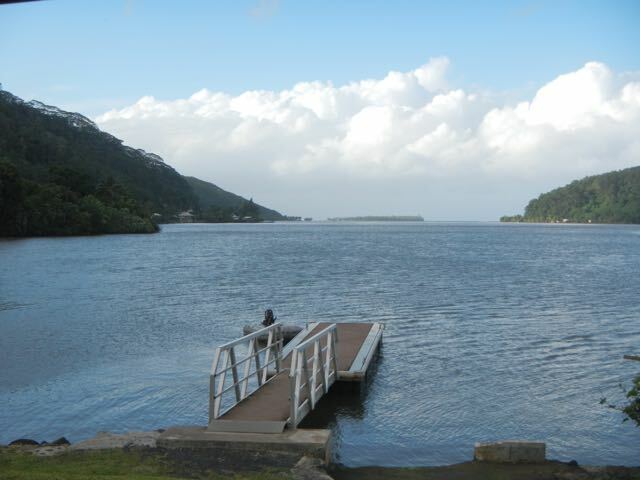 We drove past this enormous bay earlier in this trip during our auto tour of Raiatea, and we both thought that its size and beauty would be interesting to investigate further. 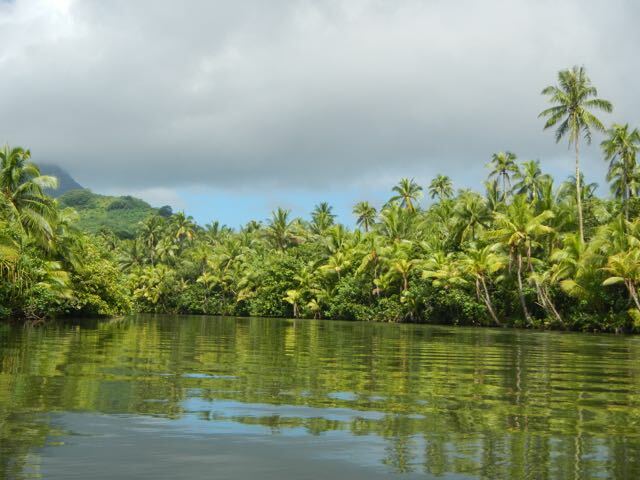 To escape the rain and see something other than Taha'a, we motored/sailed to the bay during a 5-hour sprint from the weather over Taha'a back to Raiatea..
At times, I've been focused on certain things that I thought were beautiful, and you'll have to endure several photos of this beautiful river we traveled. 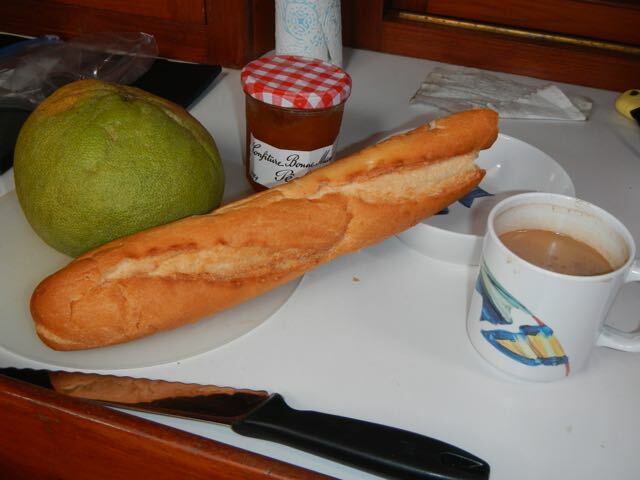 A typical breakfast of coffee, baguette, orange marmalade, and pomplemousse, a grapefruit-like fruit. 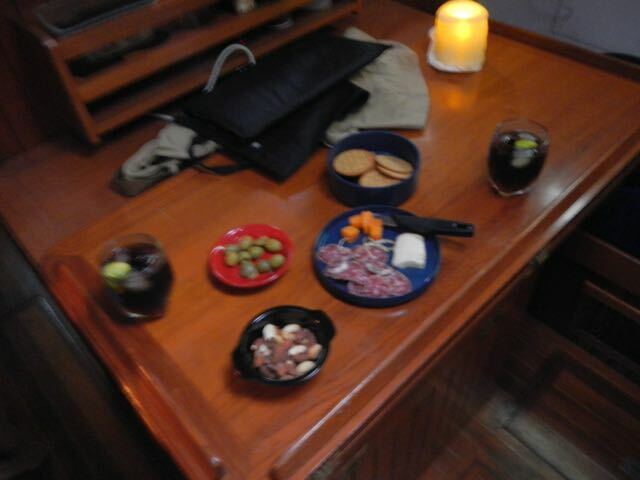 Our usual hors d'oeuvre spread that Conni prepares each evening. What a life! 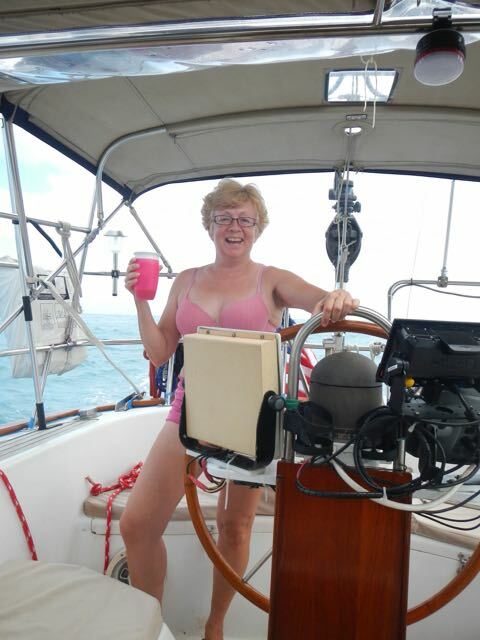 Conni in pink: pink pants, pink top, pink drink. Conni's happy! 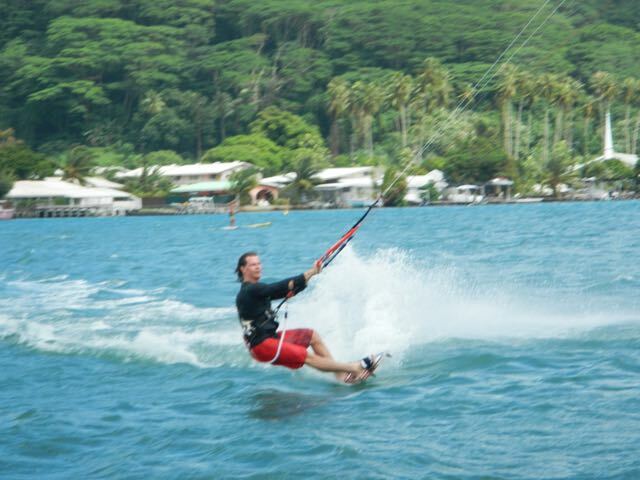 As passed by Uturoa, this kite boarder came jetting past. 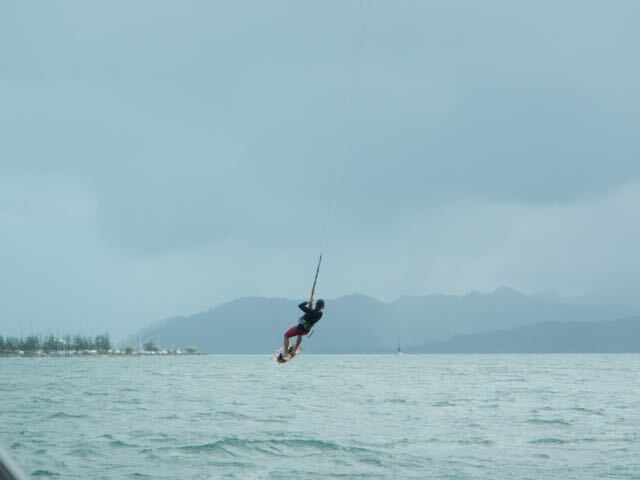 There was big wind, so I'm sure that he was very happy with conditions. Into the air! With wind as big as this, he was airborne many times, both very high up and for long times. This is the pass through which we'll leave in a few days: Passe Iriru. 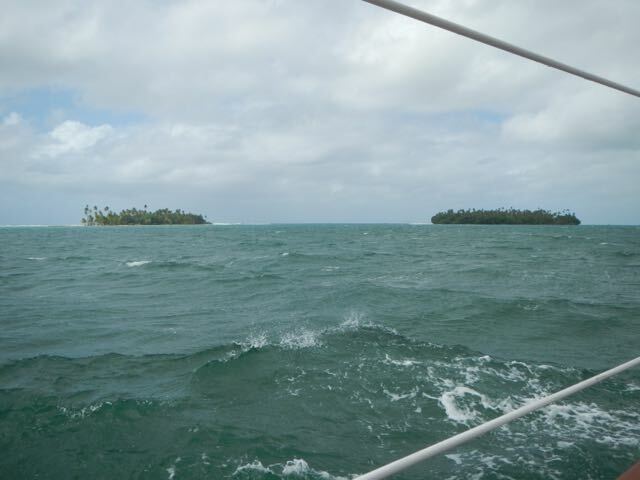 The pass itself is very narrow, but the two motus make it appear much larger. Don't be fooled! 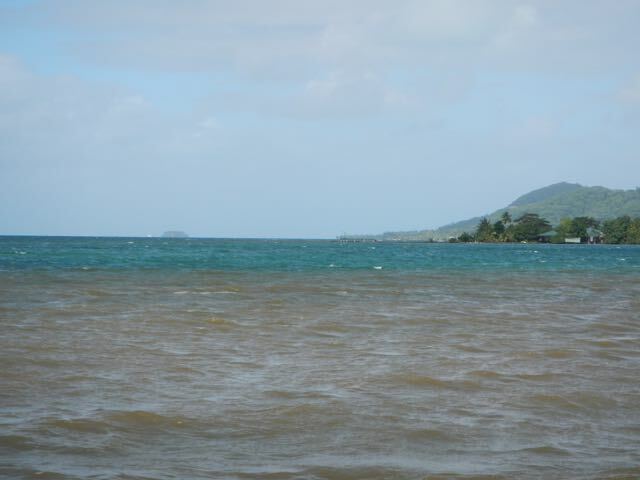 The muddy water from Fa'aroa's river is fresh and floats on top of the salt, giving this very delineated two-tone effect. 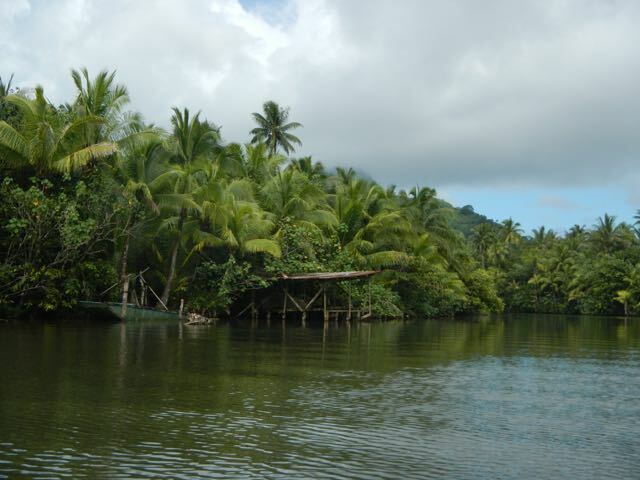 From the inner end of Fa'aroa Bay, we look from the dinghy dock toward the bay's entrance and Passe Iriru. 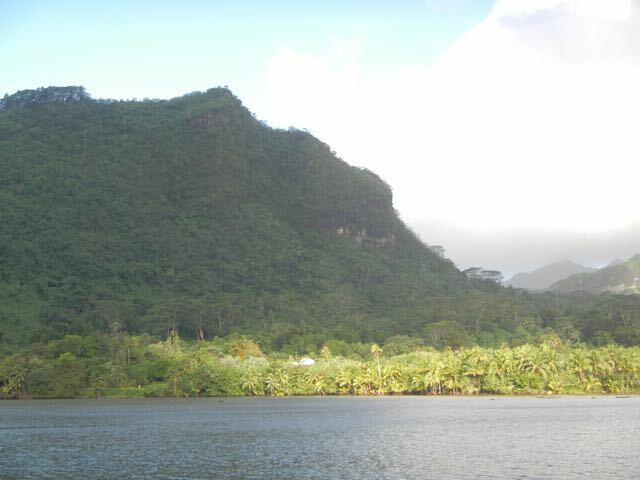 Sun glints on the huge mountainside of Fa'aroa Bay's head. Wings at her mooring the first night. 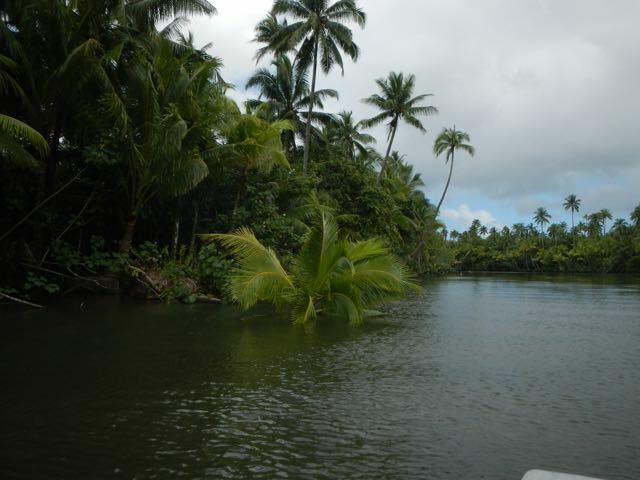 This is the entrance to Fa'aroa River. It's SHALLOW! In places, I had to lift the motor and use oars. 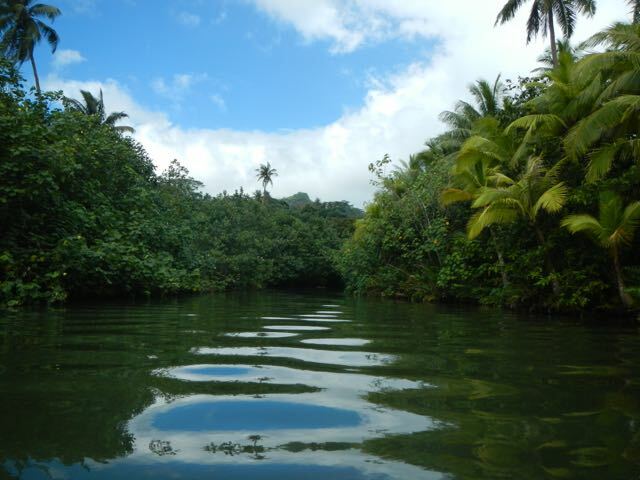 Our first long view up the river shows you the size and nature of the jungle. A settler has built this little dock on the river. Deeper into the river, it narrows. Palms line this part of the river. 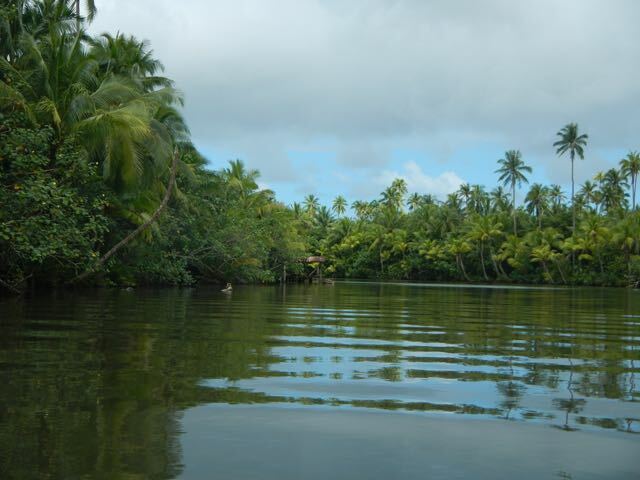 As we traveled up the river, we finally arrived at a section too shallow to pass. At that point, a man in a tiny orange plastic paddle skiff approached us, introduced himself as James, and invited us back to his place. James' family's land and James in his odd little boat. Part of the gift of fruits that James gave us. 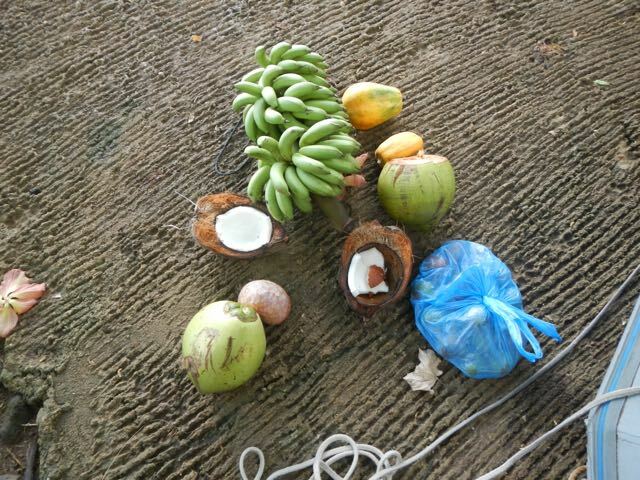 They include the stalk of bananas, green coconut, several papaya, and a bag of guavas. James and Conni discuss his life on the river. 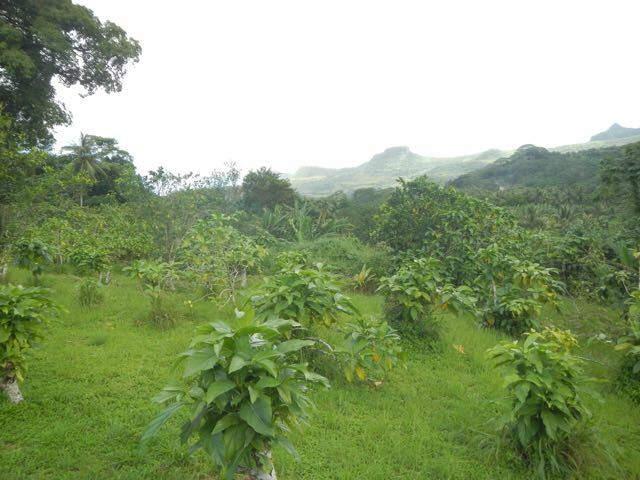 This is James' noni fruit orchard. James shows Conni the plant from which tapioca is made. I've never seen one. 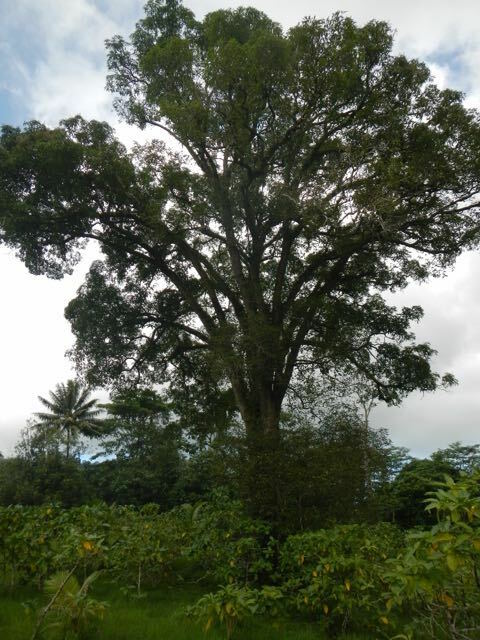 This enormous tree is a mango tree! I had no idea that they grew so tall. 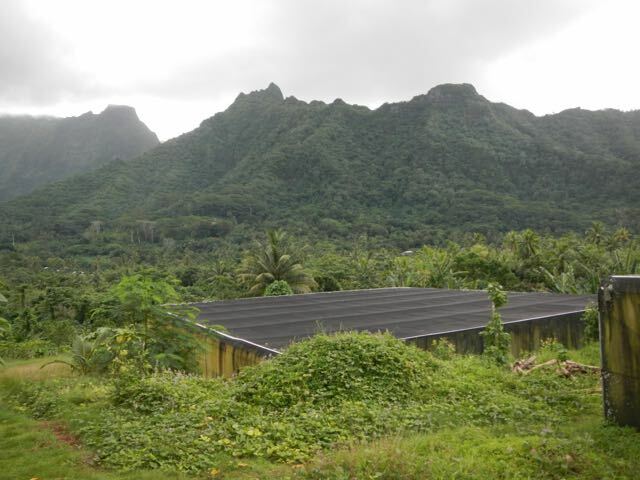 James' "maison du vanille", or cloth-covered shelter for growing vanilla. 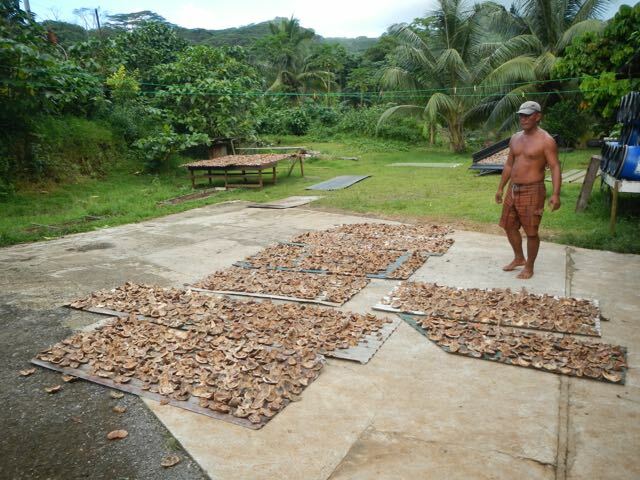 James is drying coconut into copra here. 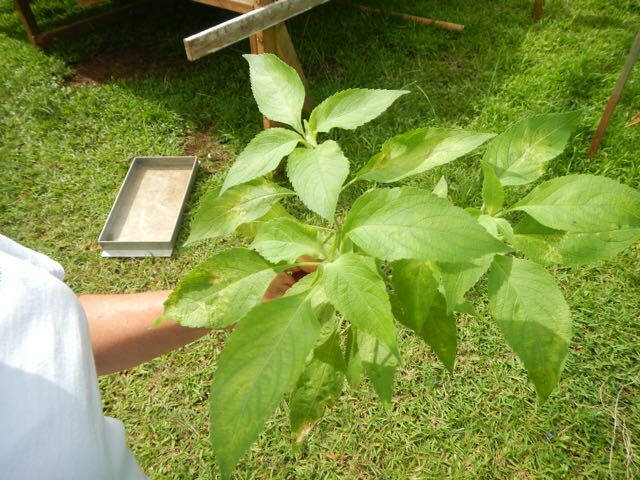 This is basil, or a Tahitian variety of it. It smelled wonderful. I've never seen a more prolific coconut tree. 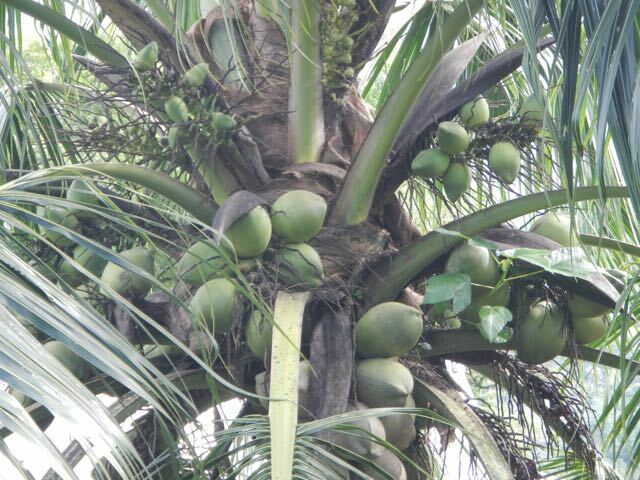 There are fifty coconuts in all stages of growth. 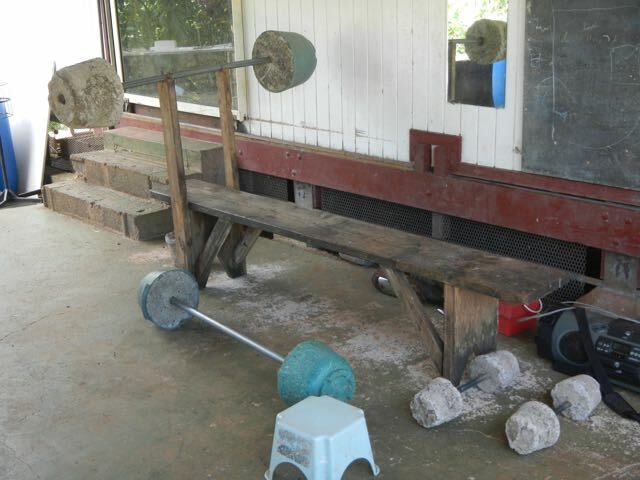 James makes his own weights of concrete. 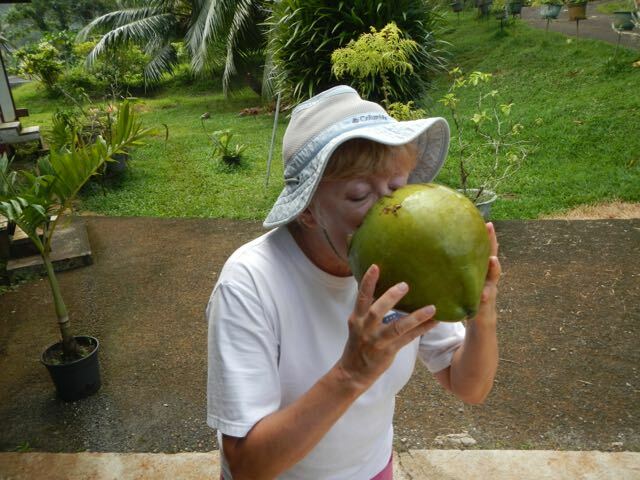 Conni quenches her thirst with a pull on a green coconut. 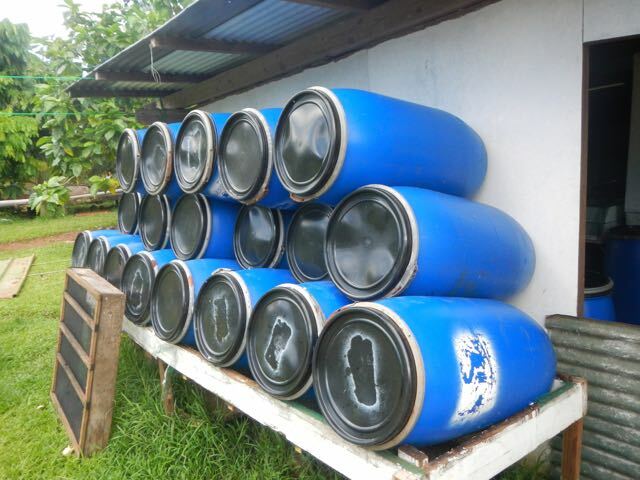 These barrels are fulled with noni fruit juice that ferments and then is sold. 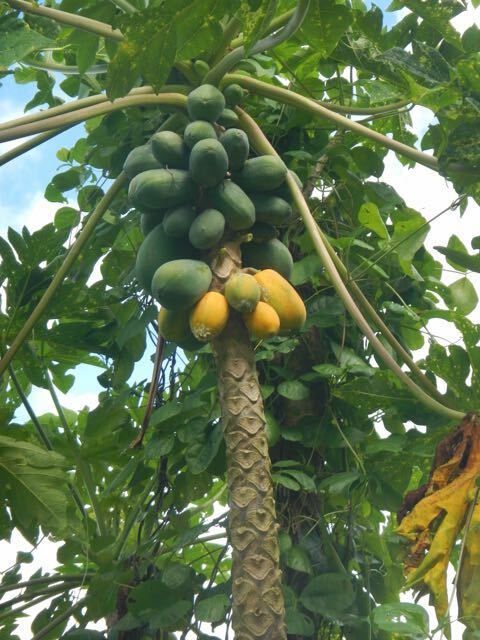 Papaya tree with fruit, and we got several of the ones here. I've never eaten a papaya this fresh. 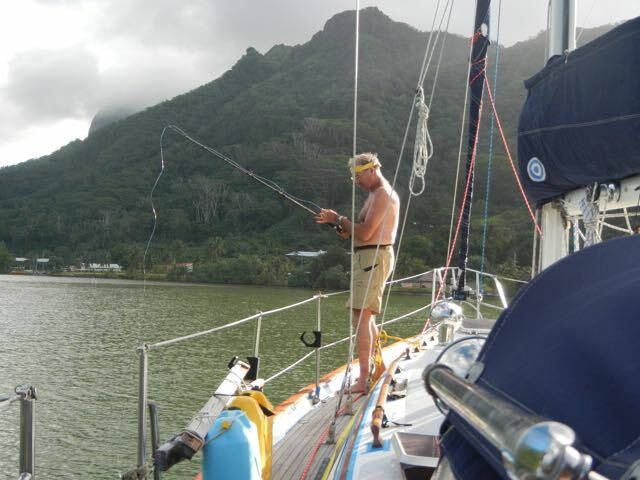 Bill gamely tries to use his deep-sea trolling rod to cast spoons, but no luck. Drat.